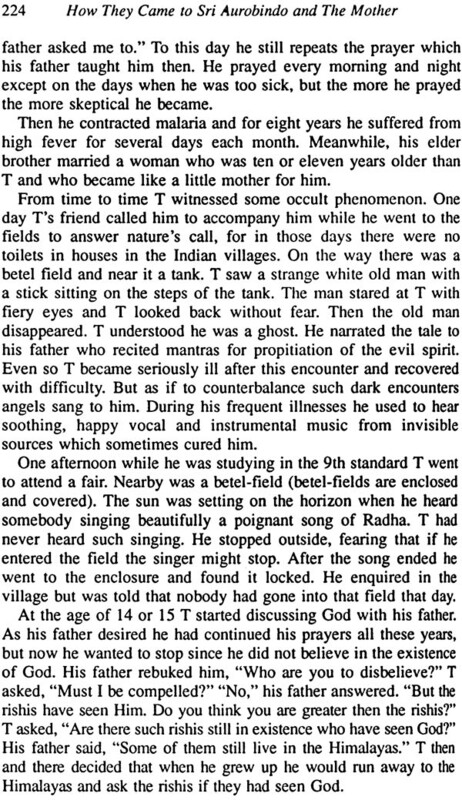 Years ago, Nolini-da (Nolini Kanta Gupta - Sri Aurubindo's greatest disciple) remarked to me, "The story of each sadhak, of how he came to the Ashram is beautiful." For years this revelatory sentence lay dormant in my mind. 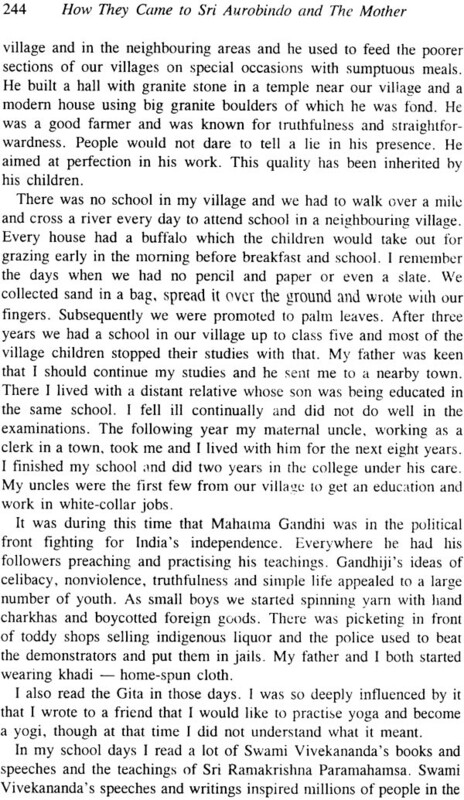 Then, one day in 1987, I remembered it suddenly and thought, "Why not write all these wonderful stories which my fellow-sadhaks have told me over the years?" 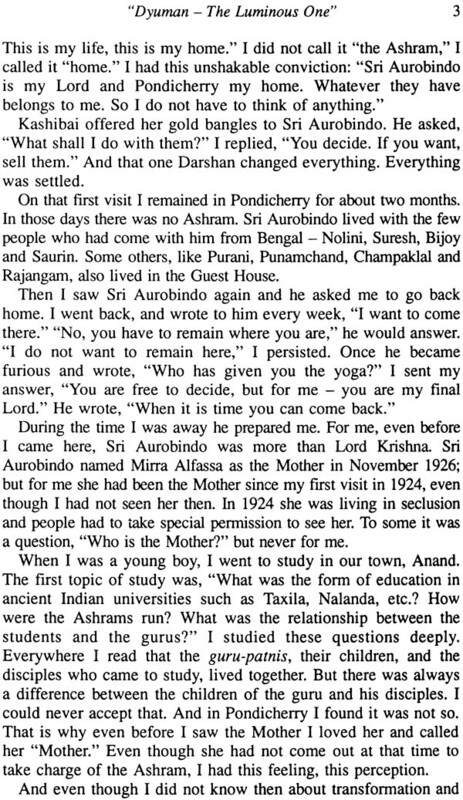 For, since my first visit to the Ashram in 1959, whenever I had met people in the Ashram, my first question to them had been, "When did you hear the sacred names of Sri Aurobindo and the Mother? How did you come to the Ashram?" People gladly answered these questions. I never forgot those stories. Then I put the idea to K.D. Sethna, editor of Mother India, of collecting and writing them down. He approved of the idea and asked me to go ahead. 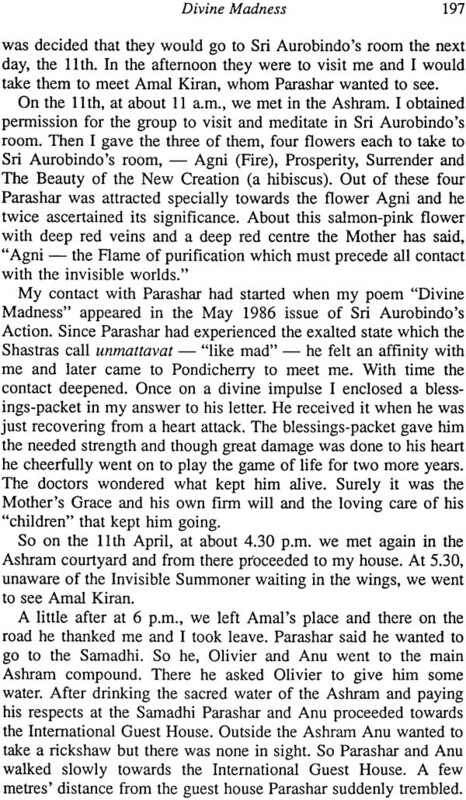 From August 1987 these stories started to appear in Mother India under the title, How They Came to the Ashram. Readers welcomed them and many came forward of these accounts, twenty-nine of which are included in this book. Seven of them have already appeared in Mother India; the rest are appearing in print for the first time. 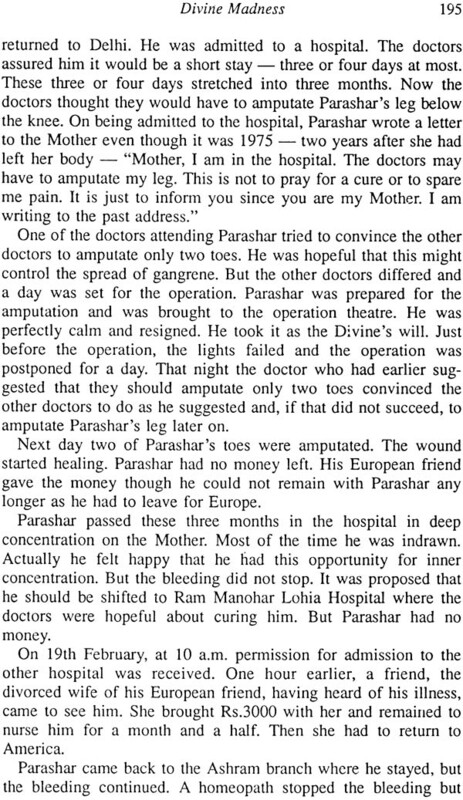 Most of the stories in this book have been based on interviews with the individuals concerned; however, Divine Coincidence, The Lord Uttered Your Name, The Ecstasy, On the Path of Light, and Unwavering Faith: The Tarachand Barjatya Story were given to me in written form. I have incorporated as much of the original drafts as possible after suitably editing them. In some of the stories I have used to first-person mode of narration so as not to lose the personal touch of the story recounted to me. I have tried to keep to the words of the aspirants carry the authentic soul-touch. Personal names have been withheld unless too obvious to mask; even the initials used do not necessarily correspond to those of the individuals concerned. To all those who have opened their hearts and laid bare their soul-secrets to me I am deeply grateful. 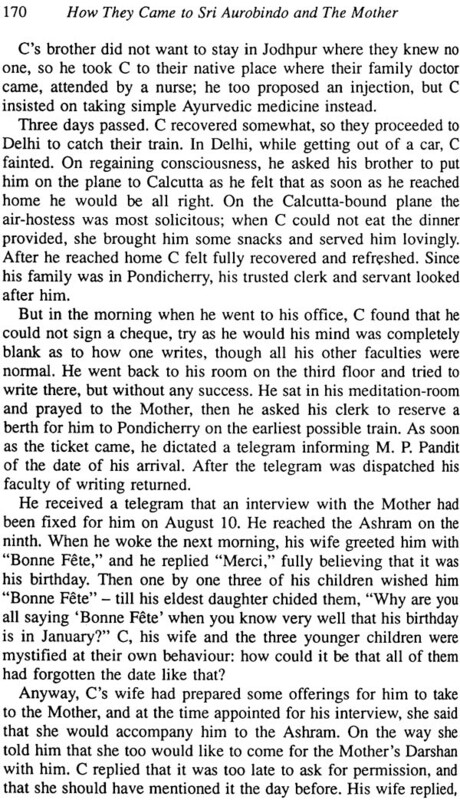 I thank them not only on behalf of myself and other devotees of Sri Aurobindo and the Mother but also on behalf of posterity. If these stories can awaken the reader and bring him nearer to the Divine, my labour will be well rewarded. Many people have contributed towards the making of this book. First of all, I think - in alphabetical order - Anand Reddy, Barbie, Deepshikha, Jhumur, O.P. Mathur, Rajendra Patel, R.S. Gupta, and Urmila Patel, for their invaluable help. I cannot thank enough my son, Kim, and my friend, Maria Jain, for their wholehearted support and untiring labour. I thank Kokila and Vasant Mehta for their spontaneous financial support for meeting part of the cost of this book. 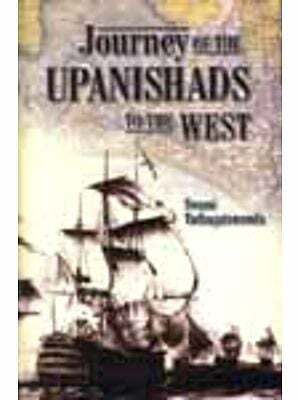 Above all, my thanks go to Shri Tarachand Barjatya for financing the publication of this book. Without his enthusiasm and generosity this book would not have been published. 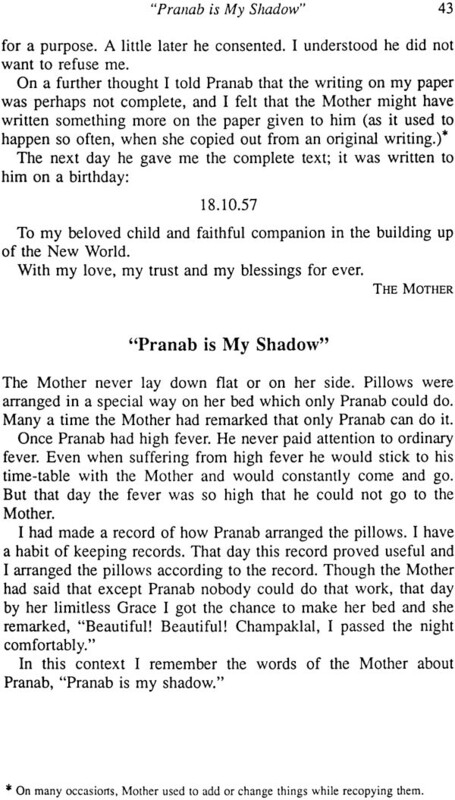 My humble and grateful Pranams to Sri Aurobindo and the Mother. Blessed are those rare pilgrim-souls who have chosen to tread the difficult path of God-realisation, the razor's edge," as the Upanishads have described it. 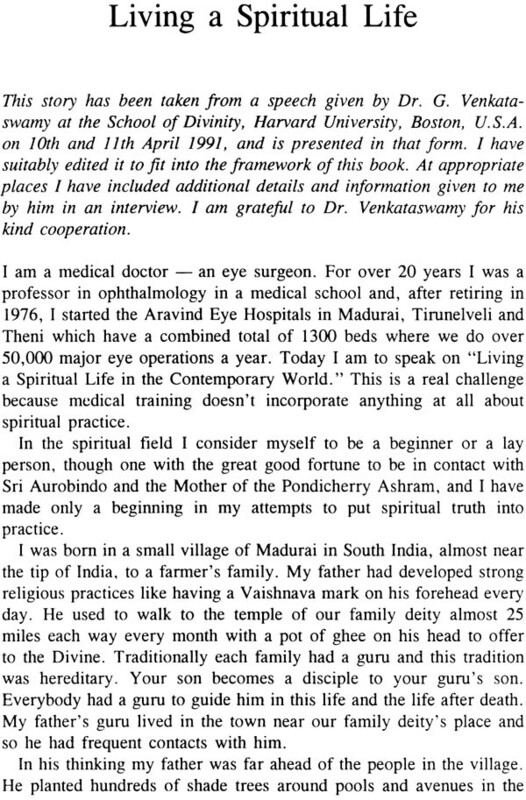 These are stories of the souls of aspirants to divinity. 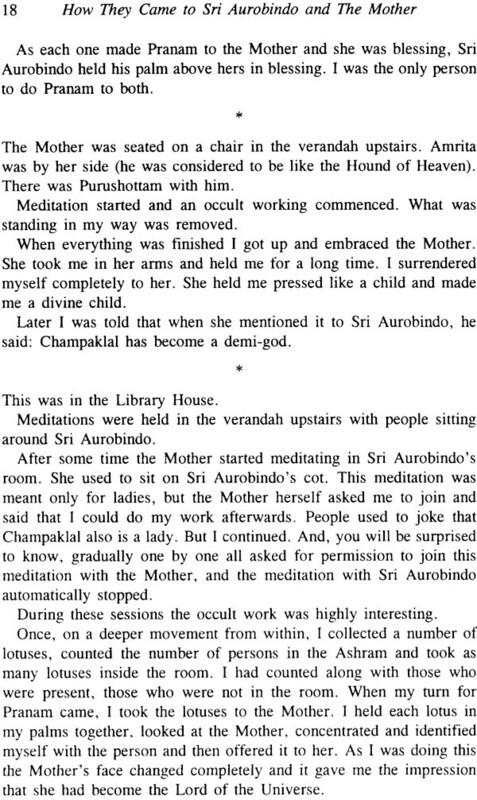 They move from point of light and chronicle the events from their first spiritual awakening and lead up to the moment of their coming to the Sri Aurobindo Ashram. 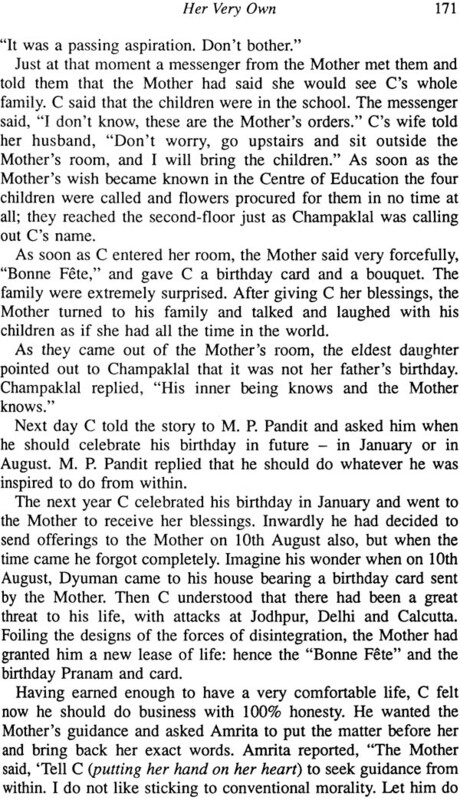 Some of the stories stop there but in others I have included the later events of the aspirants lives, specially those which are connected with Sri Aurobindo and the Mother. But the mind's meanderings, the vital-self's trials and triumphs I have deliberately left out. There are two reasons for this omission. One is that since the beginning of cereation, the human drama has been repeated in all of us with a few variation, the human drama has been repeated in all of us with a few variations, on the same age-old lines of hope and despair, pain and pleasure, success and failure, though in differing measures. An emphasis on them might have clouded and confused the issue, namely, the journey of the soul towards the Divine. Secondly, if written in detail each story would have become a short book in itself. A sadhika raised another point. She said, "The sadhaks whose stories you have written seem quite ordinary people. What is the use of writing their stories?" 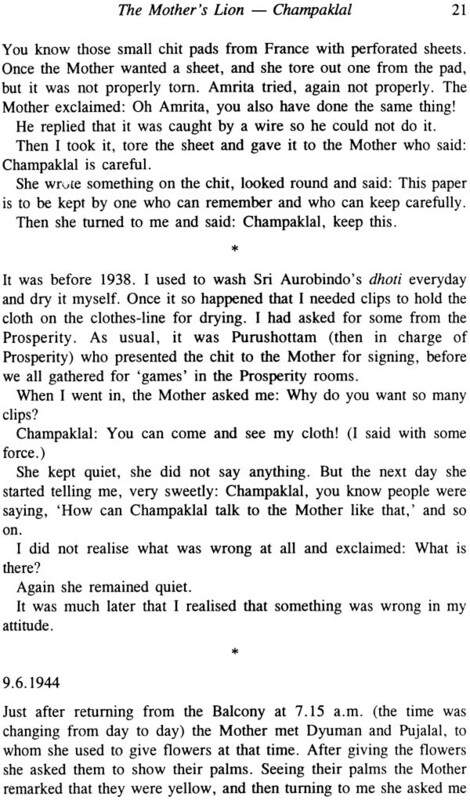 I reminded her that here, in this Ashram, Sri Aurobindo and the Mother are trying to change the outer nature of sadhaks. Heretofore, God-seekers have renounced worldly life and its myriad manifestations by retreating to forests, monasteries and convents. 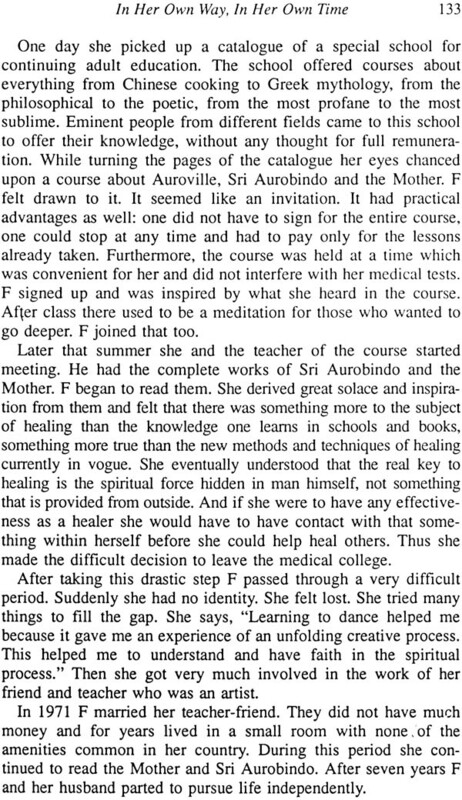 The sadhaks of Sri Aurobindo and the Mother's yoga have to attain the highest possible realization while living right in the middle of life. They are tested at each step by material success, love, riches and creative greatness. 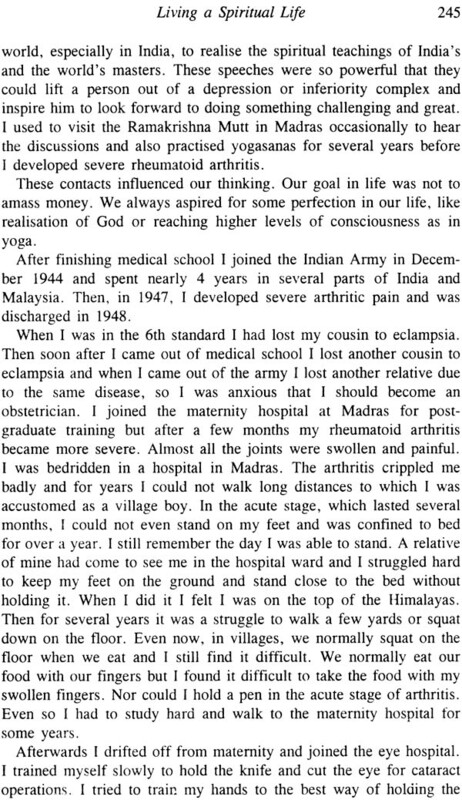 The Gods test the sadhaks of Integral Yoga severely because they aspire to a realization never even envisaged before Sri Aurobindo's advent- a total transformation ultimately including even the body. They cannot take the easy path of ascetic renunciation and retreat, nor carry a pilgrims staff or wear ochre robes to fence themselves in from the assault of life's temptations. 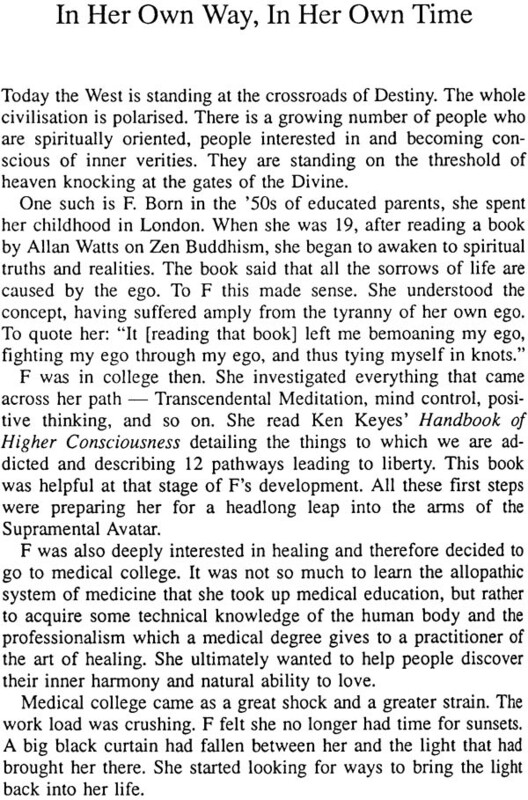 If you mean the Vedantic realization, several have had it. Bhakti realization also. 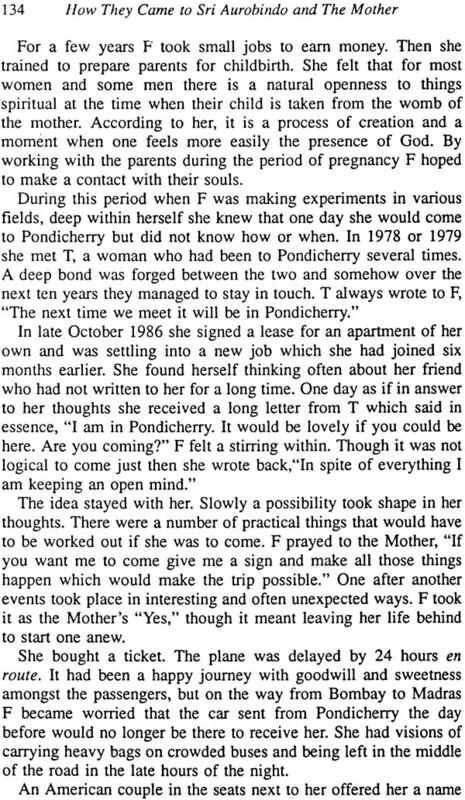 If I were to publish the letters on sadhana experiences that have come to me, people would marvel and think the Ashram was packed full of great Yogis! Even the failures would have been Gurus, if I had allowed it, with circles of Shishyas! B did become one, Z of course. But all that does not count here, because what is a full realization outside is here only a faint beginning of siddhi. Here the test is transformation of the nature, psychic, and spiritual, finally supramental. That and nothing else is what makes it so difficult." The sadhaks here in the Ashram are of all kinds and categories; some friends to the Gods, others less exalted. These stories deal with a representative cross-section of them. 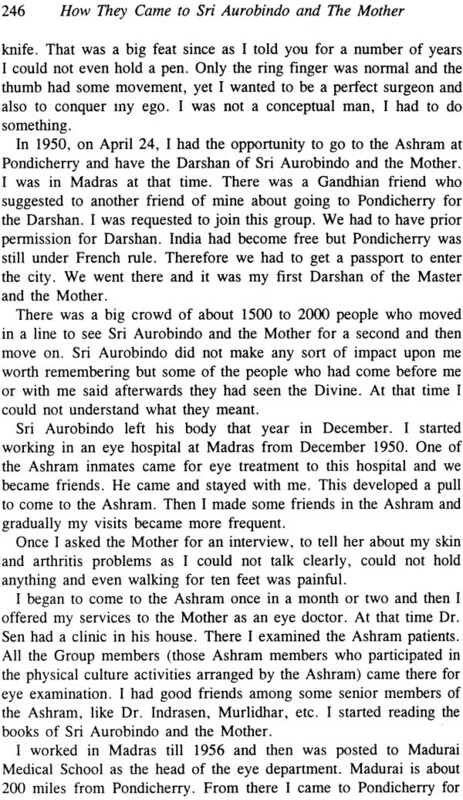 However diverse their personalities may be, a golden thread of inner Divinity joins most of them in their love for Sri Aurobindo and the Mother. Indeed, they have not chosen the Divine, they have been chosen by the Divine. Inspired by the words of Nolini Kanta Gupta, Sri Aurobidno's leading disciple, "The story of each sadhak, of how they came to the Ashram is beautiful," I embarked on a voyage of discovery. 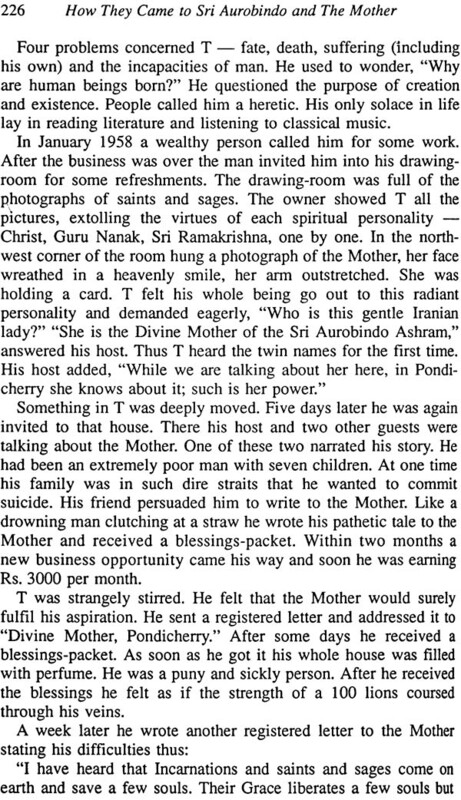 To know and record the spiritual odyssey of the disciples and devotees of Sri Aurobindo and the Mother has been an arduous but rewarding labour. 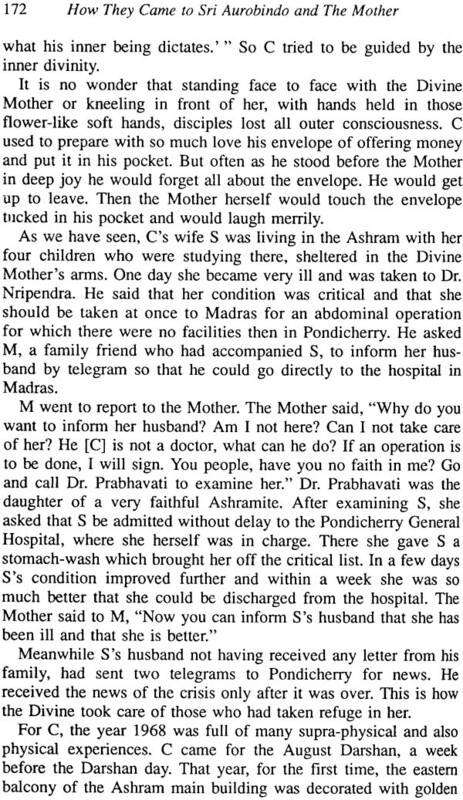 Each of these stories reveals a new facet of Sri Aurobindo's and the Mother's working. The first volume of this series came out in September 1990. Here, in this second volume, I present to my readers thirty-six more stories. The first story, Pavitra: The Pure, and part of the second, "Pranab is My Shadow" have not been written by me and have appeared in Mother India. They are included here in edited form. Of the others, seven have already appeared in Mother India under the title, How They Came to the Ashram, the rest are appearing in print for the first time. The Watershed, Homecoming, A Leaf Blown Down From Heaven, and "Stay Here" were given to me in written form. The first two have been included in this collection with one or two minor changes, of the other two I have incorporated as much of the original drafts as possible. The rest of the stories are based on interviews with the individuals concerned. I have tried as far as possible to keep the words used by the subjects of these accounts even if sometimes they might be literarily quaint or unpolished, because the original words of the aspirants carry a great truth-impact. They are more likely to bring the reader in direct touch with the soul of the events. Personal names I have withheld unless too obvious to mask, or if the name has been given by the Mother, or if the person concerned has passed away. Even the initials used do not necessarily correspond to those of the individuals concerned. Many have helped with the making of this book. I thank K.D. Sethna, editor of Mother India, for his constant guidance and encouragement. 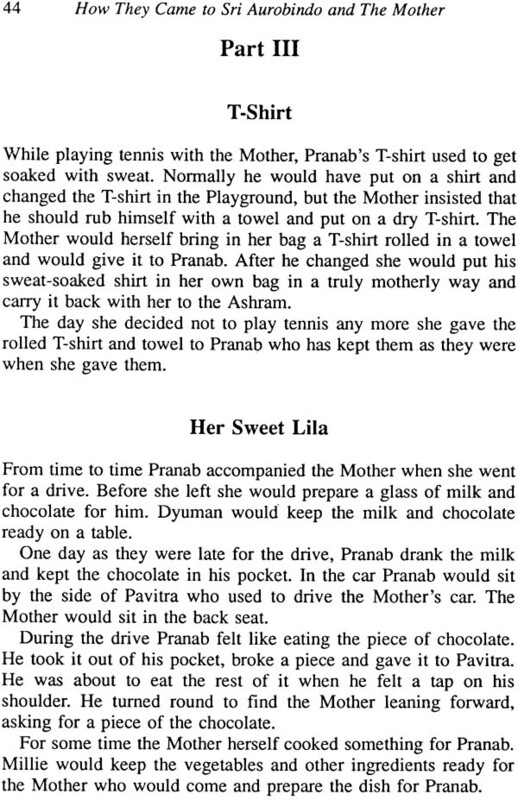 I am grateful to Pranab-da for granting me permission to publish his story and to champaklalji for allowing me to take some passages from his books for Pranab-da's story. I also thank Arima and Barbie who helped proofread this book. To Jayantilal-bhai, my special thanks for designing the cover of this book and of the first volume. Above all, I thank my son, Kim, and friend, Maria Jain, who have laboured tirelessly for months, typing, editing, proofreading and typesetting this book. Without their support I could not have published it. I thank my dear friends, Ramesh and Mani and my sister, Lalit Prabha, for their contributions for meeting a part of the cost of publication. 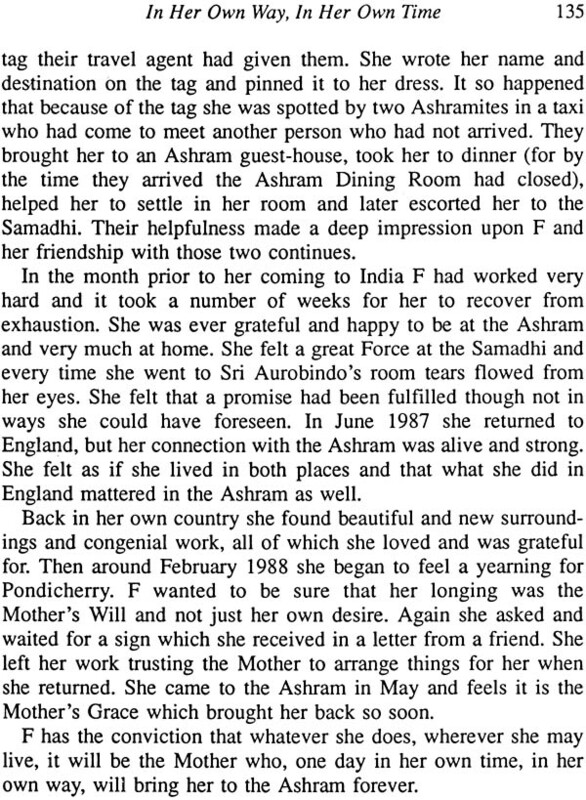 With humble and grateful Pranams to Sri Aurobindo and the Mother. Today new horizons and undreamt of realizations await humanity. The age of Reason is over; the era of Intuition has dawned. Scepticism is no longer the fashion. Man is reverting to his earliest Quest. In the golden words of Sri Aurobindo, the Avatar of super mind, this Quest "
today we see a humanity satiated but not satisfied by victorious analysis of the externalities of Nature preparing to return to its primeval longings. The earliest formula of Wisdom promises to be its last, - God, Light, Freedom, Immortality." Whenever the Avatar descends on earth, with him come his chosen instruments. Bearing the stamp of Divinity, these apostles and disciples help the Divine to hew the way to bring a new Consciousness on earth. Scriptures tell us of how, upon hearing the Call, these collaborators, comrades and servitors of the Divine, come back to their Master from far-flung places, different countries and varied climes. Such stories have fascinated humanity throughout the ages. 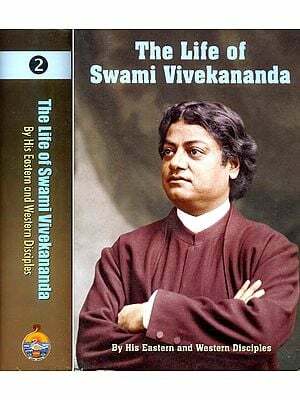 Reading of the life-story of an apostle of Christ, an Ananda of Buddha or an Arjuna of Sri Krishna can be a powerful aid in the upward ascension of God-oriented souls. This is the raison d'etre of this book. An esteemed sadhak pointed out that I have written these stories as told to me by the subjects themselves and, human memory being what it is, there are bound to be discrepancies, inexactitudes, imprecisions and exaggerations in the narration of past events. Though there might be small imprecisions of details or some unintentional exaggerations, I believe essentially and substantially these stories are true because most of the persons whose stories I have written are self-effacing and have insisted on remaining anonymous. 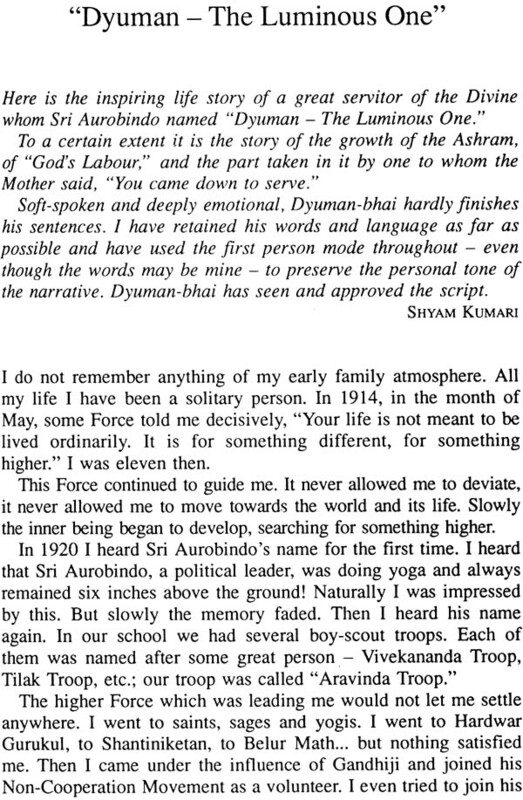 The subjects of these stories are a representative cross-section of the children of Sri Aurobindo and the Mother. Some like Pavitra and Pranab are of luminous fame, others are lesser beings; but every one has something unique. 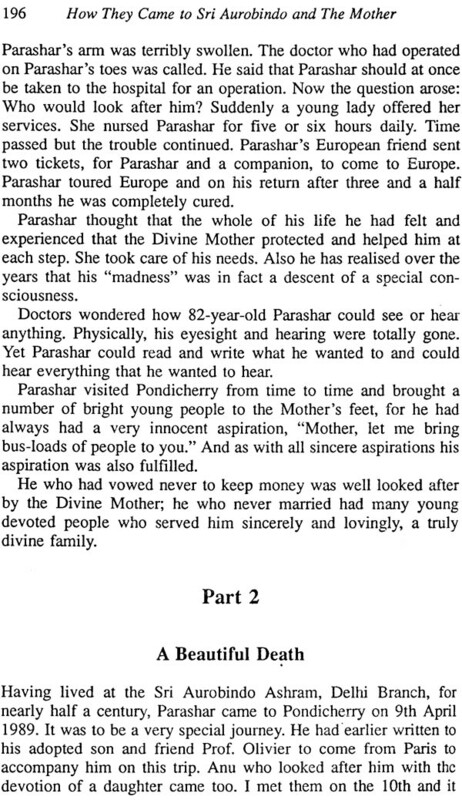 Through each of these stories the love and consciousness of Sri Aurobindo and the Mother run like golden notes. I am deeply grateful to all those who have allowed me access to their soul-secrets. 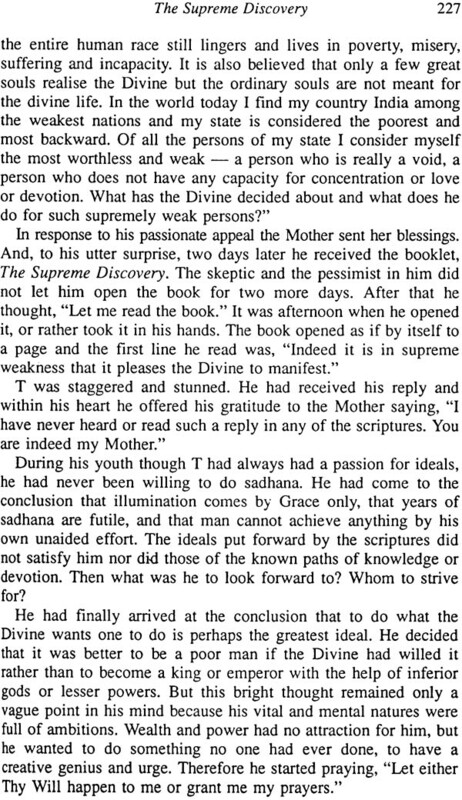 If by reading this book the reader is brought nearer to his soul, if by its influence he is drawn closer to Sri Aurobindo and the Mother and their Yoga of Transformation, my labour will be well rewarded. Whenever the Avatar descends on earth, with him come his chosen instruments. Bearing the stamp of Divinity, these apostles and disciples help the Divine to hew the way to bring a new Consciousness on earth. Scriptures tell us of how, upon hearing the Call, these collaborators, comrades and servitors of the Divine, come back to their Master from far-flung places, different countries and varied climes. Such stories have fascinated humanity throughout the ages. 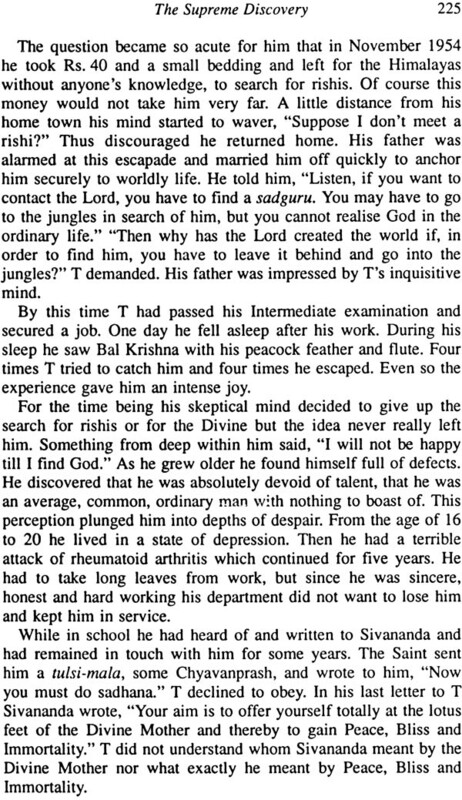 Reading of the life-story of an apostle of Christ, an Ananda of Buddha or an Arjuna of Sri Krishna can be a powerful aid in the upward ascension of God-oriented souls. This is the raison d'eetre of these books. For the most part, I have left out the mind's meanderings, the vital-self's trials and triumphs. There are two reasons for this omission. One is that since the beginning of creation, the human drama has been repeated in all of us, with few variations, on the same age-old lines of hope and despair, pain and pleasure, success and failure, though in differing measures. An emphasis on them might have clouded and confused the issue, namely, the journey of the soul towards the Divine. Secondly, if written in detail, each story would have become a short book in itself. 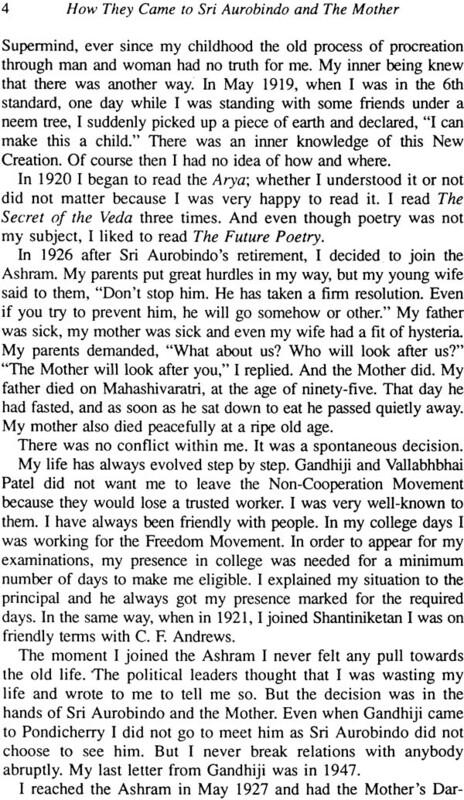 I told her that the subjects of these stories are a representative cross-section of the children of Sri Aurobindo and the Mother. Some like Nolini, Pavitra, Dyuman and Pranab are of luminous fame, others are lesser beings; but every one has something unique. 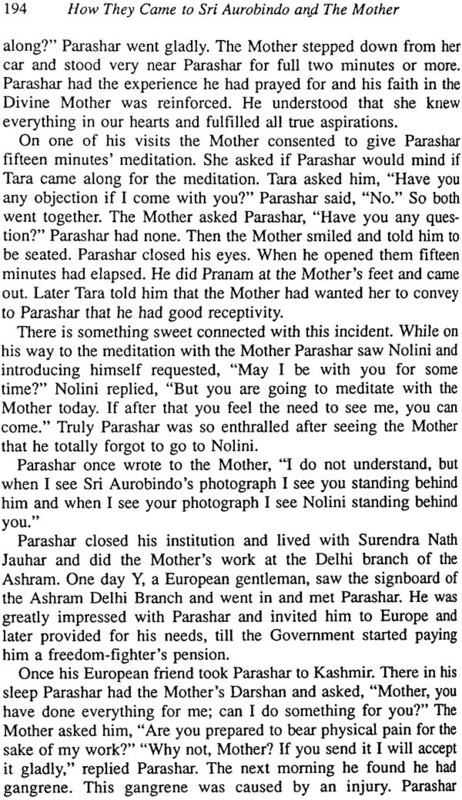 I further reminded her that here, in this Ashram, Sri Aurobindo and the Mother are trying to change the outer nature of sadhaks. Heretofore, God-seekers have renounced worldly life and its myriad manifestations by retreating to forests, monasteries and convents. 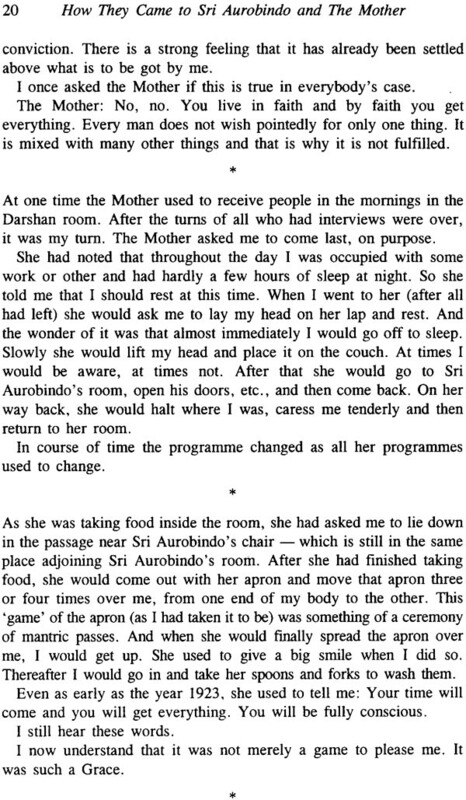 The sadhaks of Sri Aurobindo and the Mother's yoga have to attain the highest possible realization while living right in the middle of life. They are tested at each step by material success, love, riches and creative greatness. 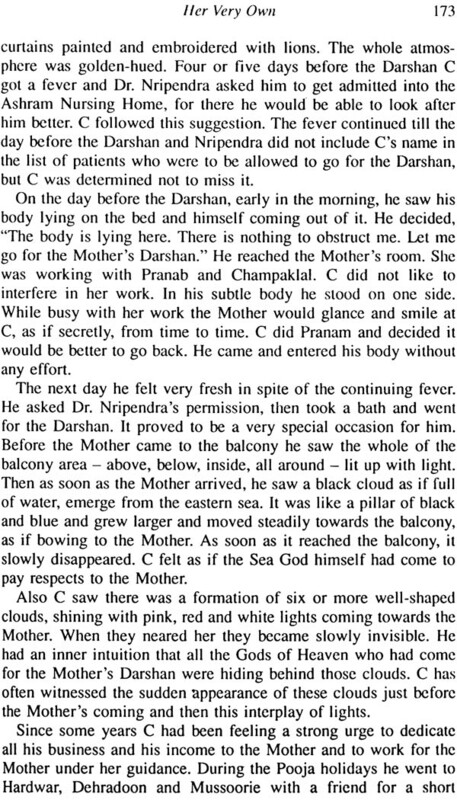 The Gods test the sadhaks of Integral Yoga severely because they aspire to a realization never even envisaged before Sri Aurobindo's advent- a total transformation ultimately including even the body. They cannot take the easy path of ascetic renunciation and retreat, nor carry a pilgrims staff or wear ochre robes to fence themselves in from the assault of life's temptations. At esteemed sadhak pointed out that I have written these stories as told to me by the subjects themselves and human memory being what it is, there are bound to be discrepancies, inexactitudes, imprecisions and exaggerations in the narration of past events. Though there might be small imprecisions of details or some unintentional exaggerations, I believe essentially and substantially these stories are ture because most of the persons whose stories I have written are self-effacing and have insisted on remaining anonymous. 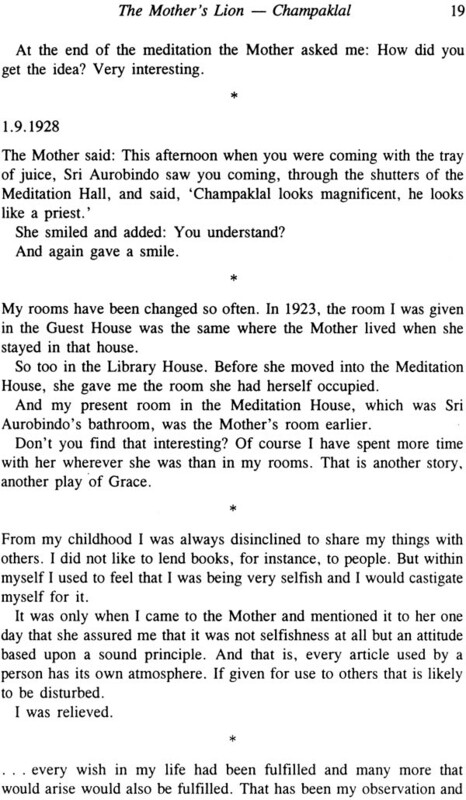 Through each of these stories the love and consciousness of Sri Aurobindo and the Mother run like golden notes. If by reading them the reader is brought nearer to his soul, if by its influence he is drawn closer to Sri Aurobindo and the Mother and their Yoga of Transformation, the purpose of these books will be fulfilled.